For as long as we humans have been able to see our own reflection, we have wanted to look our best. 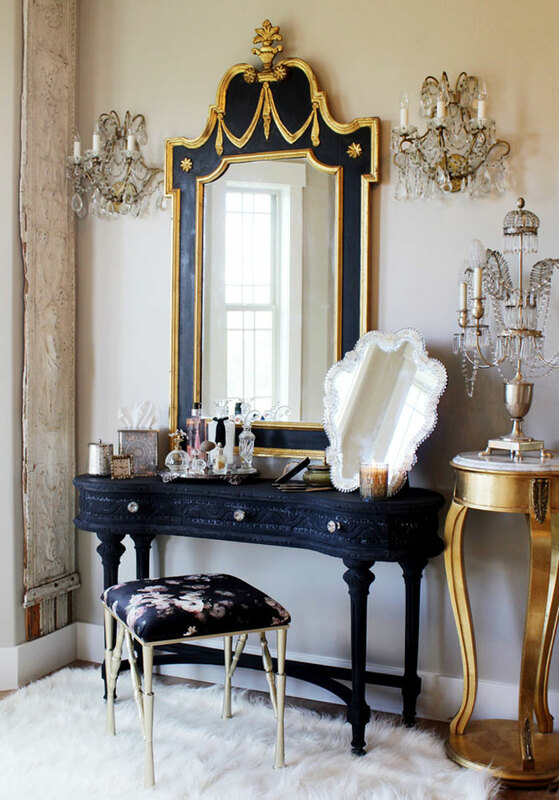 This gorgeous vanity’s high hanging mirror and low table near an open window allow for great lighting when brushing hair or putting on makeup, and the gold and sparkly accents add just a bit of elegance and style. From a small mirror box that held ointment jars and fragrance found in King Tut’s ancient tomb in Egypt, to the extravagant dressing table of Madame de Pompadour, mistress of Louis XV, vanities have always catered to the desire to look our best. The upper crust have always been able to call for their furniture makers to design their own custom made ‘dressing table’ or ‘vanity box’. The French poudreuse, the low boy, Beau Brummel and shaving table, all served as early samples for what would become the modern vanity. It wasn’t until the early 20th century, with the rise of movie stars in Hollywood, that such dressing tables became an identifiable part of modern glamour and luxury. However, vanities can serve as an excellent fixture in anyone’s interior décor and daily routine. 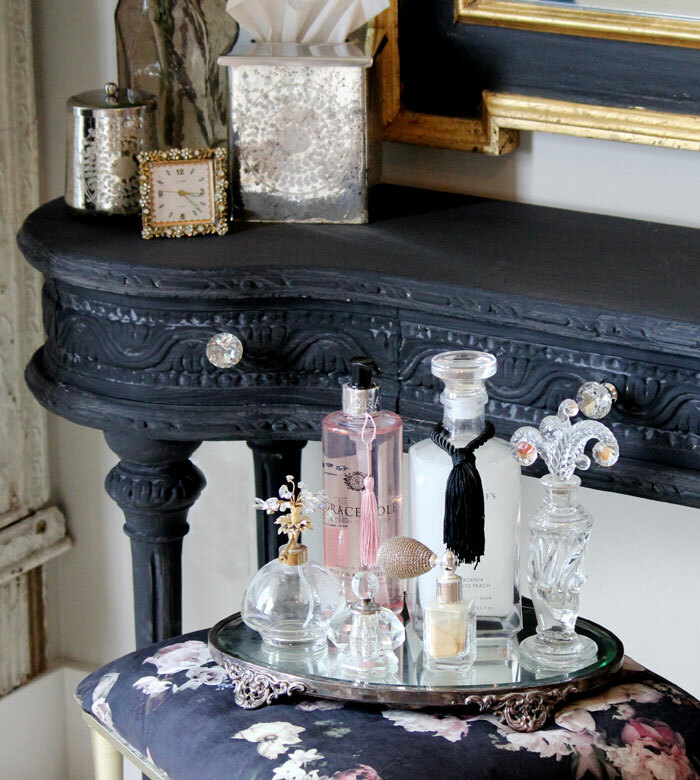 Dress up your vanity table with a collection of vintage or new glass perfume bottles. Not only can these hold your sweet and beautiful fragrances, but they can also be a great focal point for your vanity overall. Vanity tables offer a designated spot at which to prepare for the day. Instead of standing at the bathroom counter, pull up a vanity bench and take care of your cosmetics and fragrances where nobody else is brushing their teeth. In the 18th century, commonly known as ‘toilet tables’, vanities generally contained a folding top, a cistern and a basin drawer for use; but now they more commonly consist of drawers, jewelry compartments and one or more mirrors. Historically, dressing tables for women and men have not been designed similarly due to sheer function. Men stand to shave, so they have more of a ‘standing cabinet’ with stacks of drawers, featuring a single mirror. Whereas women have had more versatility with stools and low sitting tables that feature jewelry storage, drawers and multiple angled mirrors. If using your vanity has become a part of your morning routine, it’s good to keep tidy. Layer displays for your jewelry to show off the most meaningful pieces and keep them organized. Consider investing in easy-to-clean dividers, trays and drawer organizers made of transparent acrylic, so you can see the contents easily and wash them out when they get grimy. 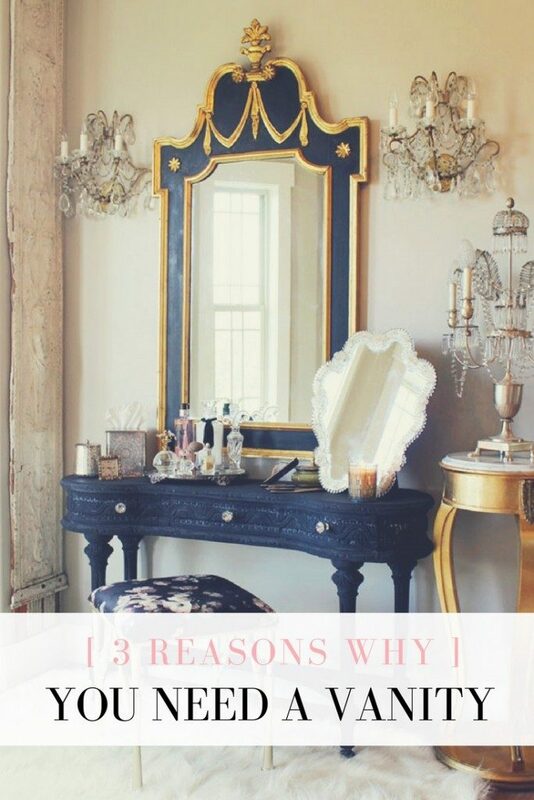 One of the most fun things about having a vanity is that you can style it to suit your unique taste. Add accents such as a small ornamental clock that will help you keep time, line patterned paper inside the drawers for a wipeable interior and use cute jars for storing cotton puffs. Finally, top your fancy tray with a vintage jewelry box or a collection of antique perfume bottles that you’ve filled with your favorite scents.